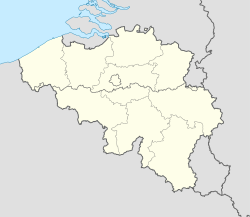 Kampenhout (Dutch pronunciation: [ˈkɑmpə(n)ɦʌu̯t]) is a municipality located in the Belgian province of Flemish Brabant. The municipality comprises the towns of Berg, Buken, Kampenhout proper and Nederokkerzeel. On 1 January 2006 Kampenhout had a total population of 10,956. The total area is 33.49 km² which gives a population density of 327 inhabitants per km². Honorary citizenship has been bestowed upon Jules Penninckx, Armand Preud'homme, cyclist Raymond Impanis, singer Will Tura, athlete Kim Gevaert and Stef Maginelle. Sabena Flight 548 crashed near Berg on 15 February 1961, killing all on board, as well as one person on the ground. In Kampenhout the Brabant Center for Music Traditions is established. It shows a collection of traditional folk music and changing expositions.